The San Diego Bike Coalition works throughout the county to provide more convenient, secure bike parking in areas where you live and work. Bicycle Valet is like a coat check for bicycles. Valet service helps ensure that bicycles and their accessories are not stolen. People appreciate the extra security of valet and our service is quite popular. 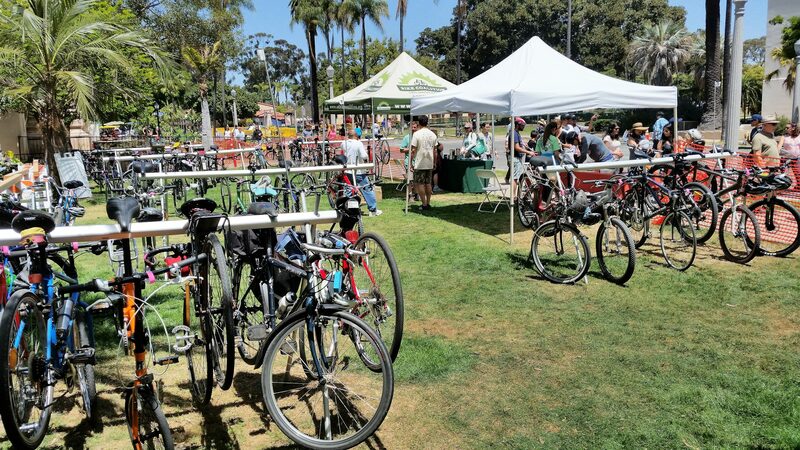 We provide the bike corral for security, bike racks for bikes without kickstands and staff to provide bike check-in and check-out. Our bike racks are also available for rent for your own staffed events. To check for scheduling and availability, click here. Purchase a U-lock and cable lock- review the instructions. 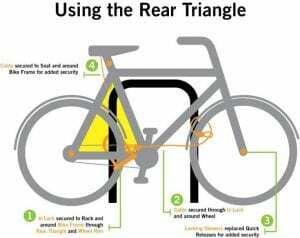 Look for proper bike parking racks. Always lock your bike, especially at home. This includes your garage, patio, yard, college residence hall, apartment building, when carrying on a car rack, etc. Lock your bike in a well-lit area where there are other bikes. Do not lock your bike in the same location all the time. Make sure your bike cannot be lifted over the object it is locked to. Create a snug fit with wheels and frame so that there is little space in the u-portion of the u-lock for a thief’s tools. Do not lock your bike to itself – front wheel or rear wheel to the frame. Always position your u-lock with keyway facing down. Depending on where you live in the County of San Diego, some cities offer bike rack programs for businesses. The City of San Diego offers FREE bike racks for businesses, the owner of the business has to request it. Rack requests should come from the fronting business owner. If you know of a business that would benefit from having a bike rack, please ask the business owner to follow the process above.